If you're sick and tired of measly 25MP sensors, this CFV-50 Digital Back back from Hasselblad might interest you--it has a sensor twice the size of those in full-frame cameras--50 MP of resolution (6132 x 8176 pixels), and it's compatible with all Hasselblad V system cameras made since 1957. It gives you RAW 3FR files (average: 65 MB/image) that are supported directly by Adobe and Apple, approximately 60 images/4GB memory card, at a capture rate of 1.1 seconds/capture. A 2.5" TFT 24-bit color display allows you to monitor your images, and you can shoot up to 8 hours using a Sony InfoLithium battery. You have a choice of shooting in the traditional Hasselblad square format (38 MP) or the full rectangular format (50 MP), tethered or untethered. Digital correction is possible using V system lenses, and the CFV-50 is compatible with view cameras with an optional adapter plate. 50 MP (6132 x 8176 pixels) sensor that's twice the size of sensors in full frame 35mm DSLRs. Compatible with all Hasselblad V System cameras manufactured since 1957. (Not recommended for critical work together with SWC models and ArcBody due to optical incompatibility. Some earlier SWC models need slight modification for battery mounting reasons). 2000 series cameras and 201F with C lenses only. 202FA / 203FE and 205FCC camera models need a minor camera modification to use F/FE lenses. All other cameras with Hasselblad V interface. Choice of shooting to the classic and loved square format giving 38 MP images or the full rectangular format giving 50 MP images. With included Phocus software for Mac and PCs, there's digital lens correction for the V system lenses, providing a new level of image quality. 2.5" TFT type, 24-bit color display. Average of 60 images per 4GB. Up to 8 hours of shooting capacity with Sony InfoLithium L battery. Tools for powerful digital workflow control using Hasselblad's Instant Approval Architecture (IAA). Hasselblad's Natural Color Solution color management included. 3F RAW file format support (3FR files also supported directly in Apple and Adobe environments. Compatibility with view cameras using an optional interface plate. System & Software Requirements Macintosh: OSX version 10.5. Compatible Cameras Hasselblad V System cameras manufactured since 1957. (Not recommended for critical work together with SWC models and ArcBody due to optical incompatibility. Some earlier SWC models need slight modification for battery mounting reasons). 2000 series cameras and 201F with C lenses only. 202FA / 203FE and 205FCC camera models need a minor camera modification to use F/FE lenses. All other cameras with Hasselblad V interface. Box Dimensions (LxWxH) 11.9 x 10.0 x 8.4"
CFV-50 Digital Back (50 MP) is rated 4.7 out of 5 by 3. Rated 4 out of 5 by unclejace from Preserving a legend in the digital age This back, I feel, is the last chance for the greatest camera system ever devised to last into this digital age. I purchased it predominantly to keep my V system alive (even though Hasselblad has discontinued the bodies, film backs and lenses). I am an outdoor landscape and fine art dude, though I have tried the tethering with Phocus and it works exceptionally well for indoor use.Overall design and functionality of the back is suberb. Image resolution exceeds what I could ever do with 4x5 film format excluding the quality of color that film has, which no CCD can touch in my opinion. The only complaints I have is that the firmware does not incorporate a battery life indicator (other than it is soon to expire) and that the recommended battery is hard to come by. Be wary of others as the voltage may be too high. Rated 5 out of 5 by Anonymous from Stunning colors, resolution I bought this back for landscape photography. I first tested my Hasselblad lenses. The older ones had lots of problems in the corners, but the newer 80mm was able to easily resolve 8 point type from 15 feet away in the center and all four corners at all apertures! The colors have a richness and depth that I have not seen in my years of shooting high end 35mm.It is also a pleasure to look down the chimney loupe and see that huge expanse of focus screen. Rated 5 out of 5 by Aero Steve from Easy to use It was almost magic. I snapped it on to my 501 after the battery was charged, and it worked. I am still evaluating it, but can't see any problems. I am comparing against medium format film, and it is hard to see the difference. Do you know if I can use this back on a Mamiya 645 Pro TL using the Hasselblad Adapter kit (B&amp;H # HAAKM645P) or do you have any suggestions of a back that I can use on the Mamiya 645 Pro TL? 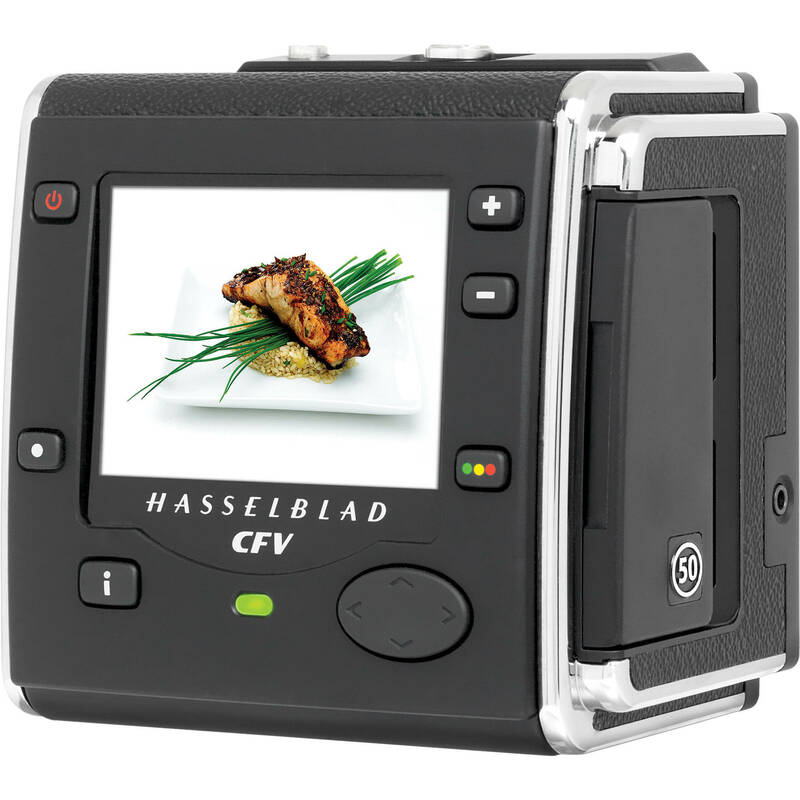 The CFV-50 Digital Back is dedicated for current Hasselblad cameras only. The adapter Plate Kit for CF/CF-MS Digital Backs (B&amp;H # HAAKM645P) is not compatible with the CFV-50, unfortunately CF/CF-MS Digital Backs are no longer available. I double checked with Mamiya and the 645 Pro TL body has no compatible back options or capabilities. Digital backs do require some connectivity to the body and lens to function and the Pro TL body which pre dates digital technology does not have the needed circuitry. The CFV-50 Digital Back is compatible with the 501CM, yes.